Backed by a team of expert artisans, we are engaged in offering a wide collection Hanuman Ji Sculptures. Our artists make use of best quality materials and paints to etch out this beautiful range. The array is available in variety of styles and sizes at competitive prices. 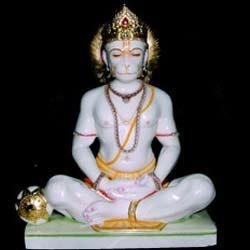 The range of Hanuman Ji Sculpture (sitting) offered by us is made out from quality marble stone, and is designed by skilled artisans and technicians. In this collection Hanuman Ji is depicted in a sitting Asana, in which he is shown in a meditation state. The main linings and textures are highlighted using suitable colors to depict the delicate features clearly. The range is available in varied styles and sizes, and is appreciated for its cost effective prices. 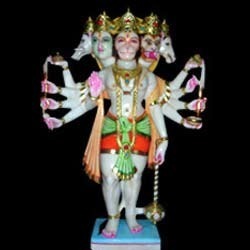 The array of Hanuman Ji (panchmukhi) is widely acclaimed for its artistic quality and looks. The range is designed to depict the Dashavatar and panchmukhi avatar of the god. Made from quality marble stone with highlighted key features in suitable colors, the range is true delight to the eyes of the devotees. The sculptures have a flat base for firm standing and balance and are offered in varied sizes and styles. Our array of Hanuman Ji Sculpture (standing) is one of the best designed sculptures crafted by our seasoned and professional artisans. The range is fabricated with quality stones to deliver high quality standard products to our customers. The sculpture depicts the Hanuman ji in standing tall position and giving blessings with his mace on one side. The range is available with us at nominal prices. 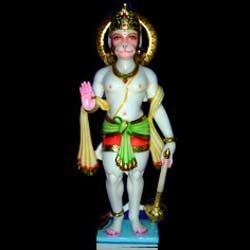 Looking for Hanuman Ji Sculptures ?